Alone they set records, and together they smash them. 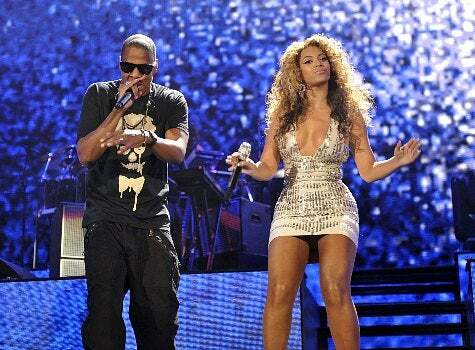 Jay-Z and Beyonce are officially entertainment's most influential couple. Together, the Carters earned an astounding $122 million in 2009, entering them into the 2011 Guinness Book of World Records for "highest-earning power couple." Here's what you had to say: Rashaan commented via Facebook: "Nice for them!" Tara wrote via Facebook: "The new young, gifted, Black, and rich!" Alone they set records and together they smash them. Jay-Z and Beyonce are officially entertainment’s most influential couple. Together the Carters earned an astounding $122 million in 2009, entering them into the 2011 Guinness Book of World Records for “highest-earning power couple.” In this case, Mrs. Carter brought home the most money — a reported $87 million, while Jay-Z earned $35 million last year. So far this year, Jay-Z has earned a reported $63 million from his “Blueprint III” tour and his work as a producer on Broadway’s “Fela!” If we do our math right, hip hop’s royal couple might break records again next year. Also making this year’s Guinness Book of World Records are superstar, and self-described “monster” Lady Gaga as the “Most-searched Female” and Michael Jackson as the “most-searched male.” Somehow Jay-Z and Beyonce’s record seems more desirable.